From lightweight but powerful electric rotary mowers - perfect for small gardens - to large commercial petrol powered machines, we've got the perfect Walk Behind Mower for you. And whichever model you choose, they all have quality and fantastic performance in common. Mowing is easy with our self-propelled lawn mowers - and with acres of grounds around our showroom, you can try out the machines on different terrains so you can be sure of making the right choice. With a range of features available including mulching and collection options, electric key-start, and anti-vibration to eliminate any discomfort over a long period of use, you're sure to find a lawnmower that suits you. We only sell what we think to be the best and, with their superior build quality and unmatched reputation, we only sell John Deere mowers. We're more than sales too. Like all the machinery we sell, are backed up with a sophisticated servicing workshop, highly trained technicians and a full parts and spares service. So you can be sure your mower will be well cared for and in good working order for years to come. 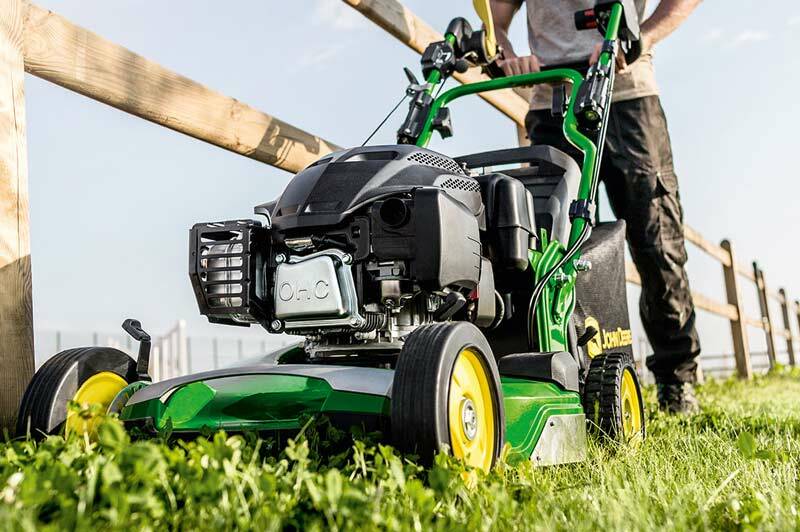 Whether you need a Rechargable Battery-powered model or something more substantial, our experts can guide you to the perfect mower. Call them on 01267 235 625. Pop by and see our range of Walkbehinds for yourself, or you can browse through our collection of equipment online.